Summary: Various enhancements you can make when finalising your voxel. This tutorial will cover misc. enhancements, clearer barrels/pipes and plating. 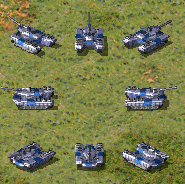 I am going to use a voxel most people got access to, the Grizzly tank. Start by opening the barrel voxel, paint it all in colour index 56. We will move away from that dark blue tinted colour WW/EA used. When you are done select top layer and paint top of the barrel with colour index 52 on the top part and colour index 50 on the bottom part. It should look like this when it is done, perhaps you wonder why. The reason is that it will reflect better ingame yet not blend with the main voxel so it will still come out clear. There is more to be done, with the current dark colour the edges will not show up in the first part of barrel, which is wider. Simply outlining it with colour index 50 will fix that (shift to back view). It should look like below. The barrel is now more clearer ingame. We will now move on to plating of the main body of the Grizzly. Start by filling up gaps of the voxel, since there will be new addons on the voxel it will receive a new set of normals (those would be the cut parts in the voxel). Paint sides and top like explained in previous tutorial (even the edges). Next step is to select the colour index 56, the plating is just a simple illusion, we do not have any proper height difference. Select the right view and move to the top edge, paint lines going down, do not paint on the top edge (it should have that enhanced edge from previous tutorial). When you are done it should look like this. Move one step further into the voxel, you will have one more section that needs plating. Draw lines in the same way. It should look like this when done. This is not enough to get it good enough ingame, you need to paint a brighter colour in the center of the plating. I painted colour index 90. It came out as this, this may take some ingame tests to get right so make sure to check. Add autonormals, do not use too smooth though as then it will look too rounded. If you know how to paint index 2 normals, those would work as well. You could do similar enhancements to the turret. I wonÂ´t explain that part as it is very similar to the body. This is the end result ingame. The result is better on larger voxels, this is merely to show how you can bring more life into the voxel. Thanks to Blaat for checking my spelling. Voxel incase you want a peek.